For any child who has compared herself to an older sibling or cousin and felt letdown, there is Prickly Rose. As a follow-up to Sitka Rose, a tall-tale about an adventurous young woman in rhyming verse, Prickly Rose, by Shelley Gill, picks up from the perspective of the previous heroine’s younger sister. The younger sister catches the moon, jumps mountain peaks, and enlists orcas to help her travel in a search for her older sister. By the end of the story, both sisters learn to appreciate sisterhood and each other. The joyful, lyrical rhymes will entertain children and entice their imaginations to create their own fantastical adventures. The diction evokes a younger protagonist. For example: “Nighttime tracking stunk without the moon as guide, so Prickly yanked it closer and formed Alaska’s tides.” The lines are fun, a bit silly, and easily relatable for elementary-aged children. Picking up on the lively language, Judy Love’s illustrations show both human and animal characters as animated and fun-loving. The porcupine is especially adorable, but it’s the images of the sisters reuniting and enjoying each other’s company at the end that evoke true happiness. 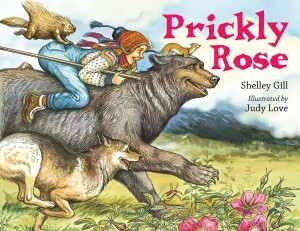 Prickly Rose is a great introduction to the tradition of tall tales for younger readers.